alpha-Synuclein (phospho-Ser129) antibody detects endogenous levels ofalpha-Synuclein only when phosphorylated at serine 129. The antiserum was produced against synthesized phosphopeptide derived from humanalpha-Synuclein around the phosphorylation site of serine 129 (M-P-SP-E-E). Small volumes of anti-SYN antibody vial(s) may occasionally become entrapped in the seal of the product vial during shipment and storage. If necessary, briefly centrifuge the vial on a tabletop centrifuge to dislodge any liquid in the container`s cap. Certain products may require to ship with dry ice and additional dry ice fee may apply. 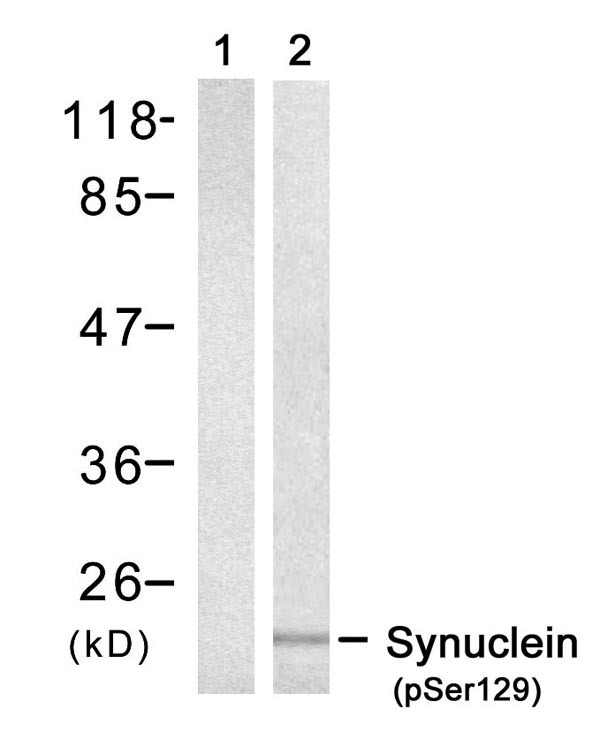 Western blot analysis of extract from mouse brain tissue, usingalpha-Synuclein (phospho-Ser129) antibody. NCBI/Uniprot data below describe general gene information for SYN. It may not necessarily be applicable to this product. Jakowec MW, et al. (2001)Dev Neurosci.23(2):91-9. Kitamura Y, et al. (2001)Brain Res.898(1):181-5. El-Agnaf OM, et al. (2006)FASEB J.20(3):419-25. 1. The results are the first demonstration that post-translational modification of alpha-Syn can induce different strain formation, offering a new mechanism for strain formation.